A Florida woman who says she is Jewish has angered neighbors and received death threats over a holiday display in her yard that calls to mind Auschwitz. The display, erected last week ahead of Halloween, is full of skeletons, some saluting Hitler and others with concentration camp numbers on their arms and yellow Stars of David on their chests. 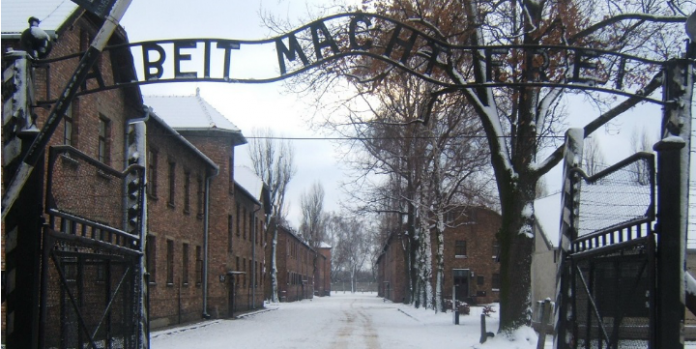 Behind the skeletons is a sign reading,”Arbeit Macht Frei,” or Work Sets You Free, the statement found on the entrance to the Auschwitz Nazi camp. The owner of the home, Susan Lamerton, told reporters that she is Jewish and she put up the display after fighting with the Home Owners Association over a sign with a Star of David that she had put in her yard. What would happen if the display was about slavery?